Research works of objects of Near-Earth space are carried out in the Laboratory of near-Earth Astronomy (LNEA). It was founded in 2000. The head of laboratory is Shulga Alexander, C.Sc., Senior Researcher. 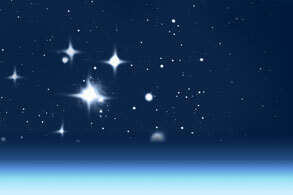 Sector of Geospace solves problems related to the observations of man-made space objects (SO) in the near-Earth space. Staff members have developed methods of observations of objects moving relative to stars using fixed telescope. The developed methods allows astronomers to obtain images of the SO with any speed. The control of measurement errors is carried out by the comparison of the coordinates of the AES equipped with corner reflectors and ephemerid of International Laser Ranging System. Accuracy of observations of the SO on telescopes is presented in the Table 1. Together with Odessa AO a numerical model of the ASE motion is developing. The catalog for orbital elements of the SO was created. Staff members have performed work on maintenance of elements of start up of Dnepr launch vehicles. The observations on the program of monitoring system and analysis of conditions in space in Ukraine also are carried out. In addition, work on the formation of a Geomagnetic Disturbance Index of the total electron content of the ionosphere on the basis of measurement made with hardware and software complex (HSC), developed in the RI NAO is carried out in the sector. measuring instrument of seismic deformation waves on the basis of astronomical pendulum clock (ACF) developed by Fedchenko . Works on observations of near Earth objects, at the time of their closest approach are carried out in the sector of astrometry for potentially dangerous objects in Solar system . Observations are carried out on FRT (Fast robotic telescope) and Mobitel using a combined method of observation. From the results of observations at the FRT the mean-square error (MSE) positions of NEA 12-16m relativly to ephemeride of Jet Propulsion Laboratory (USA) was of ± 0.25 "- ± 0.56" . From observations at the Mobitel (CT-50) for 2010 for NEA 12-18m MSE was of ± 0.13 "- ± 0.37". In 2010, works on the observations of meteors in optical and radiorange started. The software for automatic registration of meteors in the optical range was made. Methods of observations of meteors on the signals from FM radio stations using an antenna-type “wave channel” were approved. Semi-annual array data of monitoring observations of meteors in the FM range was processed. Scientific and Technical Group (STG) is engaged in development and modernization of telescopes. There are two telescopes that were designed and created by The STG. They are FRT (2004) and Mobitel (2009). The Group also took part in the modernization of AZT-8 and AZT-28 telescopes in National Center for control and test space vehicles (Evpatoria). In addition, the STG have established television channels for low-orbit space objects observations using telescopes from Lviv and Uzhgorod astronomical observatories. The STG is involved in software development for automatic control of telescopes and observation process. The developed software is used for telescopes such as AMC, FRT, Mobitel, AZT-8, AZT-28, TPL-1M at the Astronomical Observatories of Nikolaev, Lviv and Uzhgorod. Group developed a rotating platform - a mechanical device that rotates CCD camera around the lens axis of telescope. Rotation of CCD camera enables the use of synchronous charge transfer (time delay and integration) for objects with an arbitrary direction of motion. Currently, the LNEA works are carried out within the framework of fundamental research: determination of precision coordinates of objects of natural origin, maximally close to Earth, using the original CCD technology. Head Shulga A. V., 2010-2012, № 0110U000259; study the dynamics of the orbital motion of near space objects subsequent to the results of ground-based optical observations and radio-technical means. Head Shulga A.V., 2011-2013, № 0111U000084.